Halloween is one of my favourite times of the year. Yaya, me and our friends always make a big deal of it. Usually, the day consists of a copious amount of fake blood, lots of makeup and a spooky party spirit. 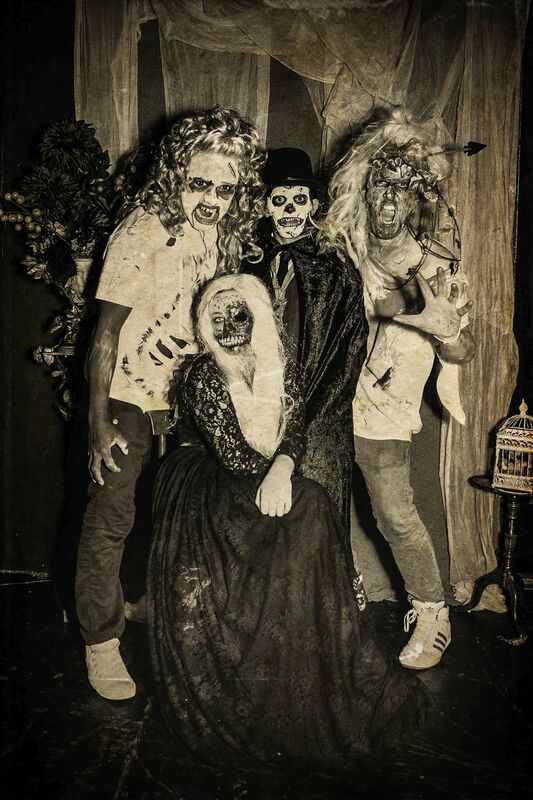 Before we hit London town, we always get together to throw a Halloween party, which usually involves lots of Bloody Marys and other Halloween food ideas to gorge on. Now, for me, Halloween is all about the dressing up, so I insist that anything we make for the party is quick, easy and, of course, a little spooky. More than anything, I have no problems in taking a few shortcuts in preparation, especially if you want to focus on your outfits. 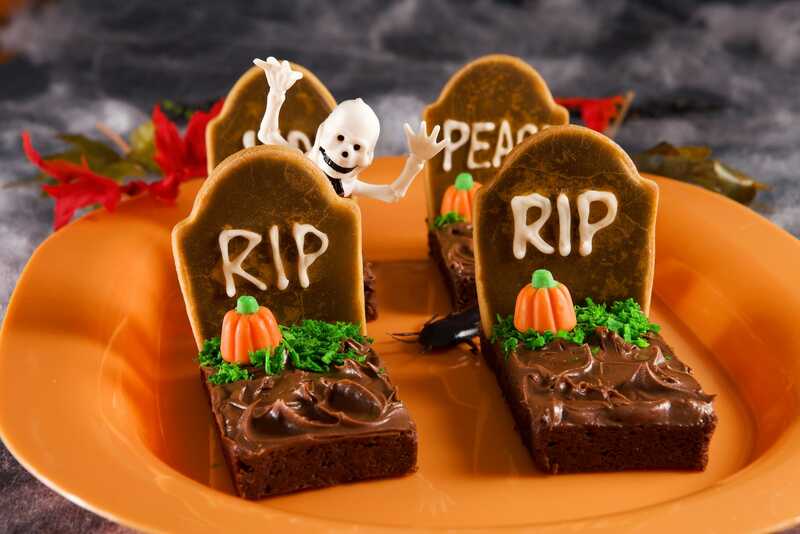 Now, I’m a total cheat with these Halloween food ideas and I usually end up buying my cookies already baked. That being said, if you want to bake them from scratch, that’s amazing. 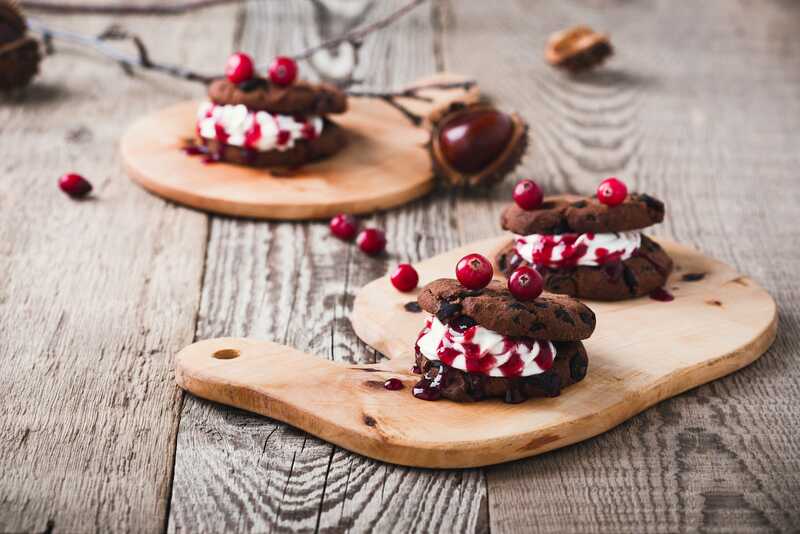 Once your cookies are sourced, grab two and fill in-between with clotted/thick cream, drizzle with lashings of raspberry or strawberry sauce (the blood) and pop two berries on the top for eyes. 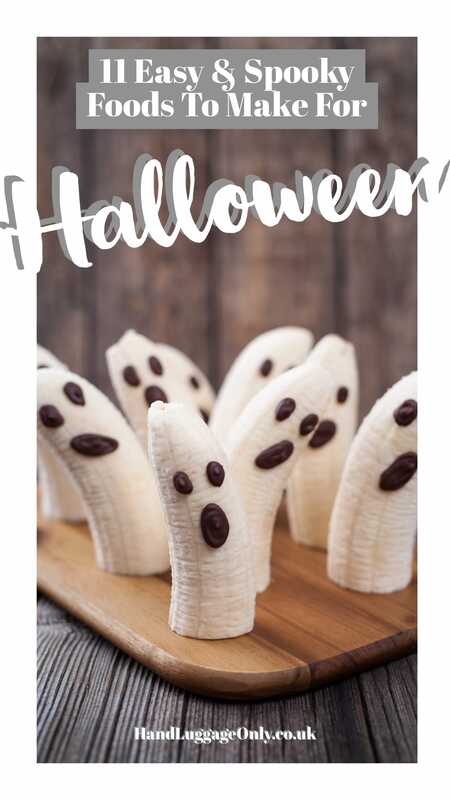 Possibly one of the easiest spooky treats and Halloween food ideas to make. Chop up a big bunch of bananas (the firmer the better) and pop them upright to stand proud. Once ready, dot a few little eyes (and a mouth, if you like) with a little tube of chocolate icing. Another easy treat to make. 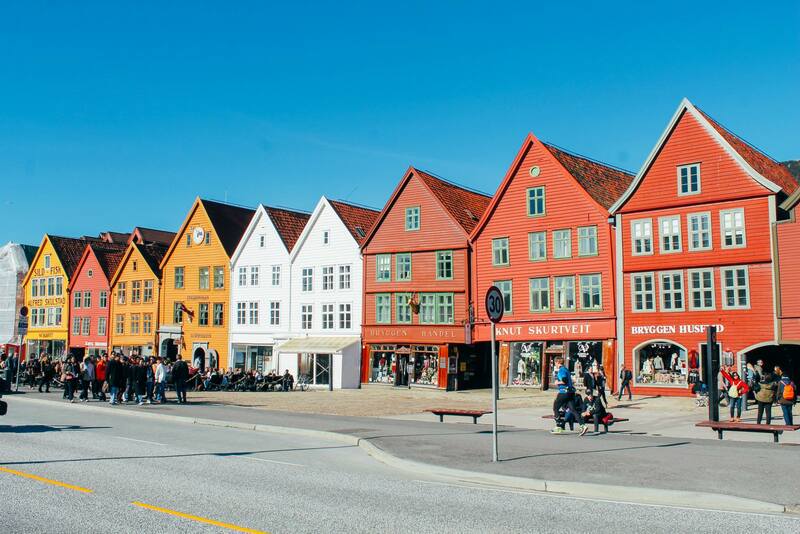 Grab yourself some sliced Edam cheese from the Cheese Monger or Supermarket (depending how fancy you want to be) and slice each piece three-quarters of the way up. Make around 5-6 cuts depending on the size of the slice and roll into a pipe shape and squeeze the top to hold the shape. Once completed, grab a thin breadstick and carefully pierce the top of the bristles. 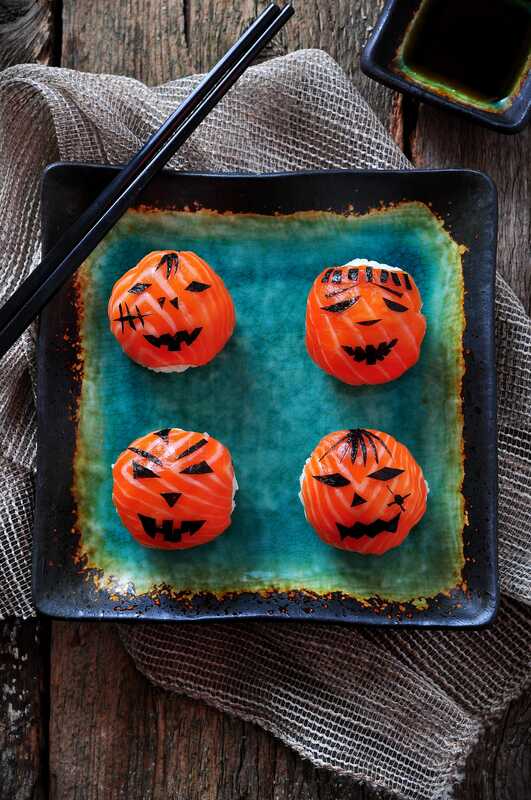 This makes one of the best (and totally spell-binging) Halloween food ideas to gorge on. Hey presto, you’ve made some Witches brooms that are much cooler than a cheese and pineapple stick. 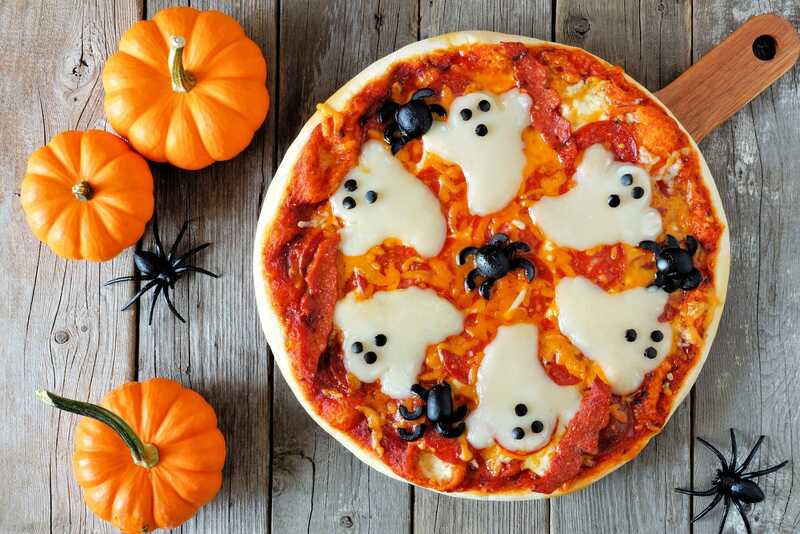 Another one of the quick Halloween food ideas is a petrified pizza. Grab yourself some freshly prepared pizza’s to stick in the oven (whatever flavour takes your fancy). 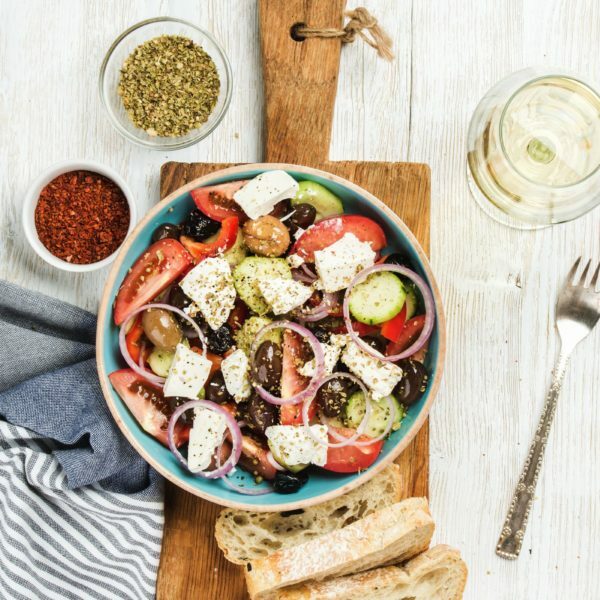 Once home, Grab a few balls of mozzarella and shape into some ghost-like silhouettes. Now, if you’re anything like me, it’ll take a little practice (especially after a few glasses of wine – lots of my first tires looked more like blobs than ghosts). Anyway, once shaped correctly, pop in the oven and cook for between 12-18 minutes. 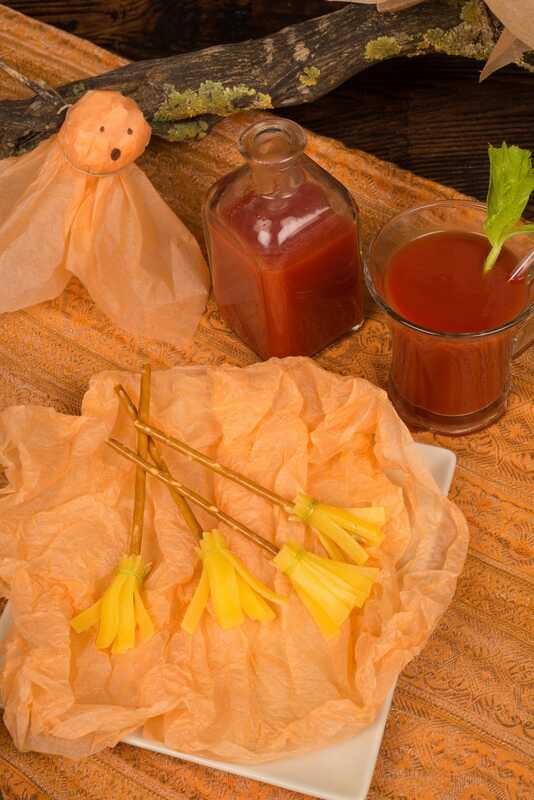 It’s one of the easiest Halloween food ideas to conjure up if you’re on a tight schedule. 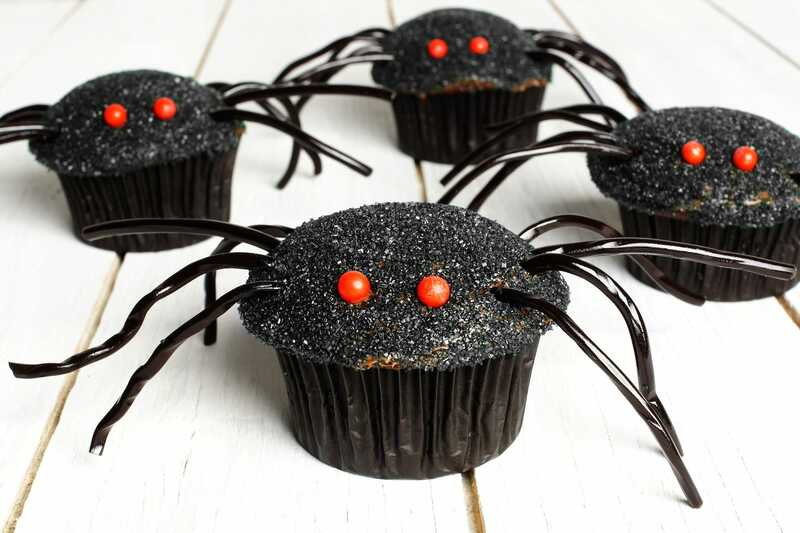 Oh, and don’t forget to add a few black olives (and some chopped up olives) to make some creepy-crawly spiders. For extra spice and bloody looking pizza, add a few drops of Tabasco sauce too. 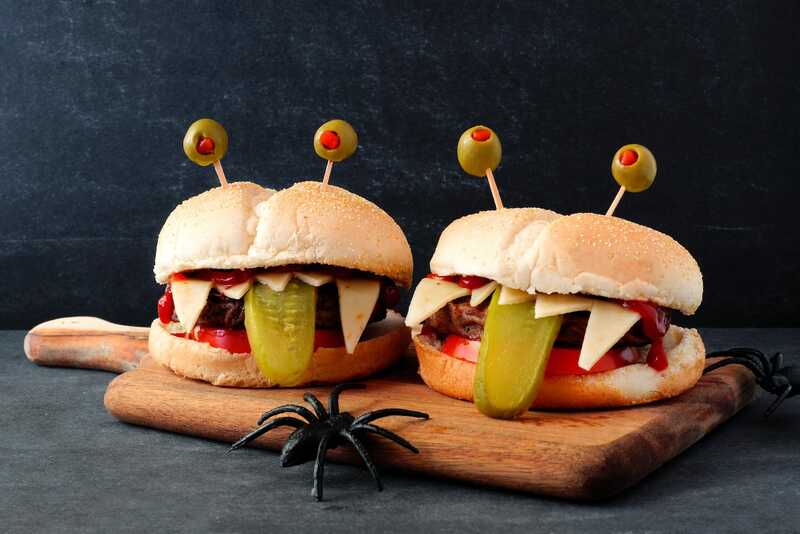 First off, buy some good quality burgers (beef, turkey, vegetarian – whatever floats your boat) and grab a few crusty burger rolls, olives, cheese slices gherkins (pickles, if you’re across the pond) and lashings of ketchup. 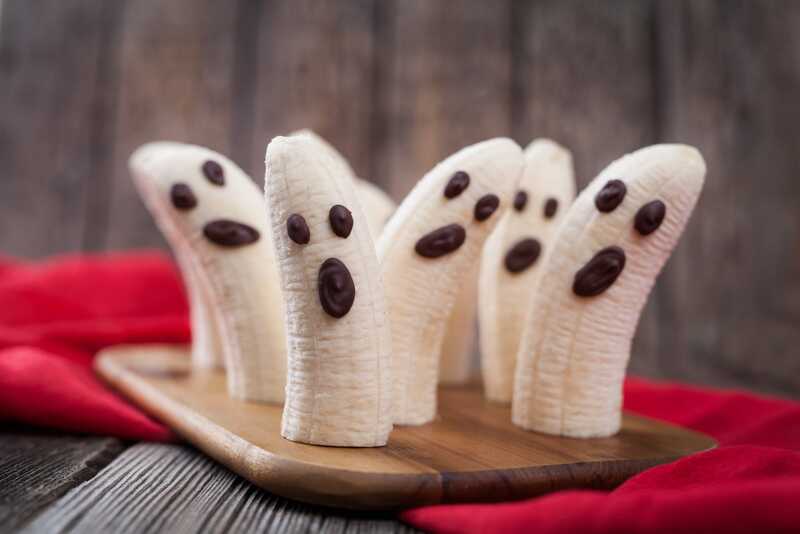 All these together make for one of my favourite Halloween food ideas this year! Cook the burgers, as usual, just make sure to cut the rolls on one side and slip the burger in. Add a few scary cheesy teeth and a long slice of gherkin for its tongue. First off, grab yourself some white rice, wasabi, fresh salmon (or smoked) and a few pieces of seaweed paper. After sourcing your ingredients, boil some rice and keep it quite sticky to form some balls. After cooling, wrap with some salmon (or smoked salmon if you prefer) and cut the seaweed paper to make cuts, gashes and eyes. The scariest sushi you’ll find and one to impress the guests! If you want to add some oozing sores, add a little wasabi coming out of the drawn gashes you make. Extra spicy and a one of the scarier Halloween food ideas to try. If you’re looking to hand out some healthier trick or treat goodies, make yourself some of these angry apples that are ready within minutes. Cut your apples into quarters, leaving the skin on and cut a smaller groove into the middle of each quarter (as per the picture). Once crafted, add a slither of peanut butter inside the groove and add a slice of strawberry for a bloody tongue. 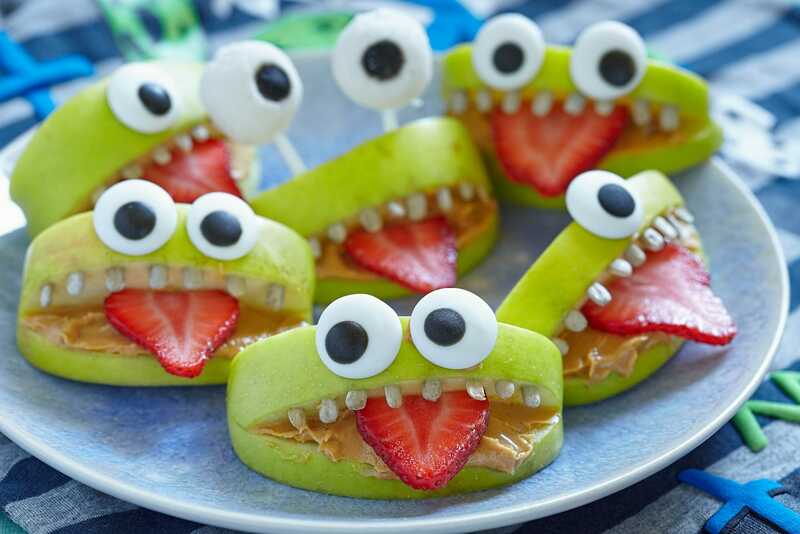 To finish, add some icing eyes that can be stuck to your apples with a little dollop of peanut butter. All finished off with sunflower seeds for the teeth. 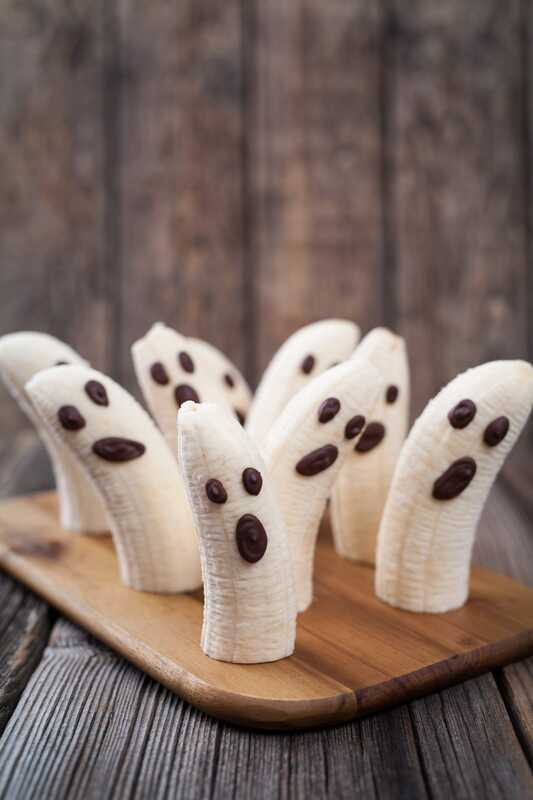 This is one of the pretty healthy Halloween food ideas to share with kids. Possibly one of my favourites to make, these will take a little more preparation. Either make a pastry from scratch or buy some rolls of puff pastry in the frozen section of a supermarket. Once ready, cut the puff pastry roll into thin lines and wrap untidily around a sausage or sausage meat. Pop the sausage rolls into the oven (until golden brown) and finish off with some Edam cheese and pepper seeds for eyes. 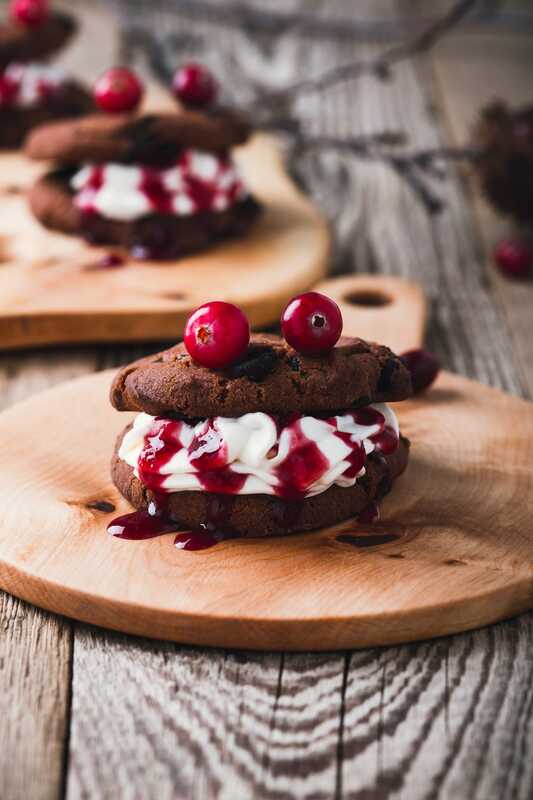 Alternatively, use a little icing to create the eyes, they just don’t taste that great with a savoury dish. 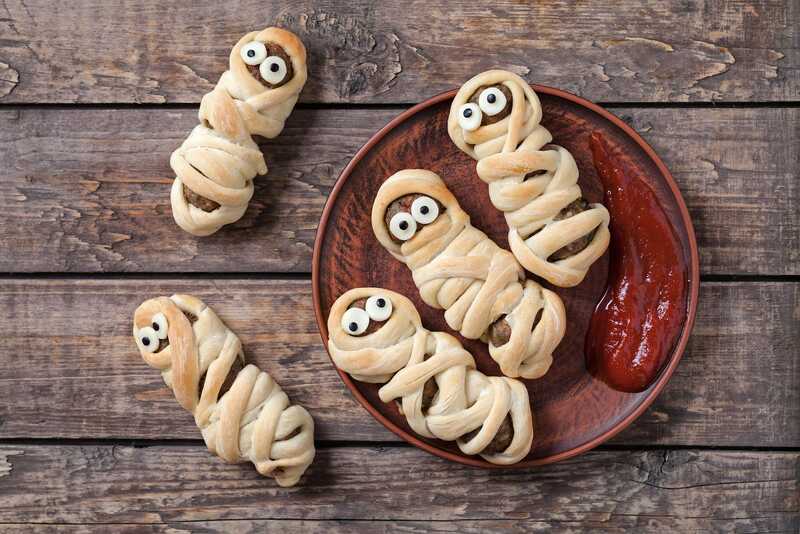 Complete the dish with dollops of bloody ketchup for one of the cutest Halloween food ideas. Finish off with some RIP letters painted with icing sugar on the gravestone and sprinkle some dried and grated citrus fruit for grass onto. Another easy treat that can literally take seconds! Grab yourself some fresh muffins from your bakery of choice and head straight to your local sweet shop to pick up some liquorice laces. Once home, stick the laces into the muffin to make the spider’s legs. For eyes, either use Nerds in the US or Millions in the UK. If you can’t get either, use a berry or coloured icing ball. This will then transform these into one of the creepiest Halloween food ideas to try. 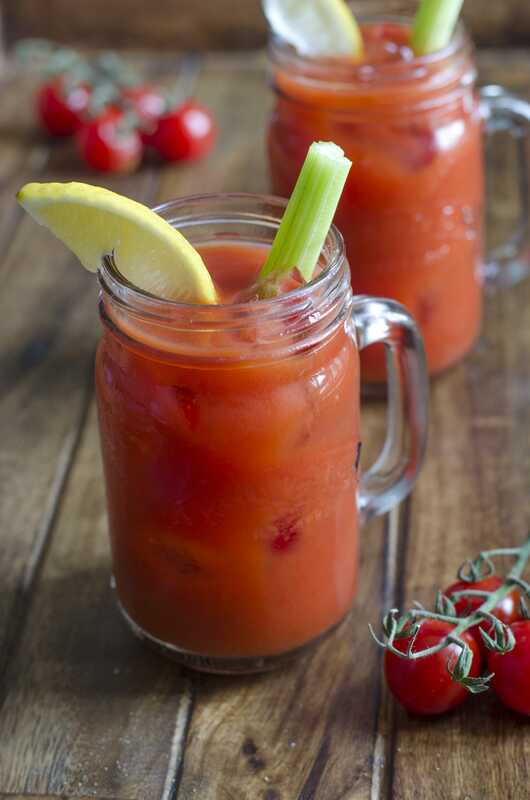 With not a drop of alcohol in sight (unless you want), you can produce a Virgin Bloody Mary. A tomato-based cocktail that includes lashings of Worcester Sauce, Tabasco and a few pinches of salt and pepper. Finish with a fresh slice of lemon and Vodka if you want to make an adults version. Serve with a big stick of celery. 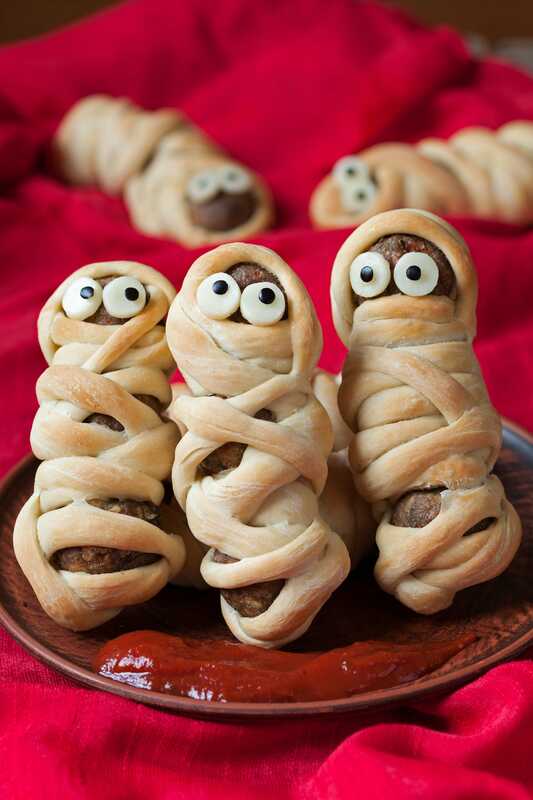 Now, it might not look like one of the scariest Halloween food ideas but it’s totally yummy! 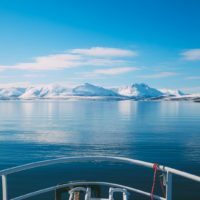 What’s It Like To Swim In The Freezing Arctic Sea? We’re in Austria! Let The Skiing Commence!!! 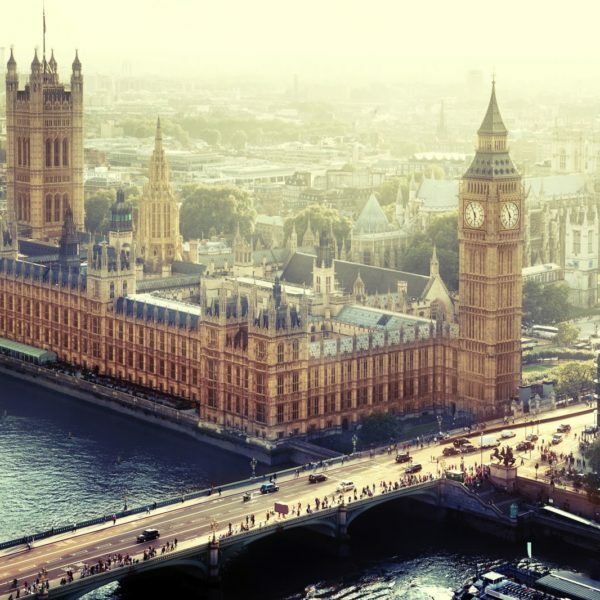 8 Things You Have To Do In London This Winter! Photography Cheat Sheets – Amazing Tips For Brilliant Photos! This Is A Rather Fun Experience To Have With Friends In London! The 9 Most Magical Places In The World To Propose (Or Be Proposed To)! 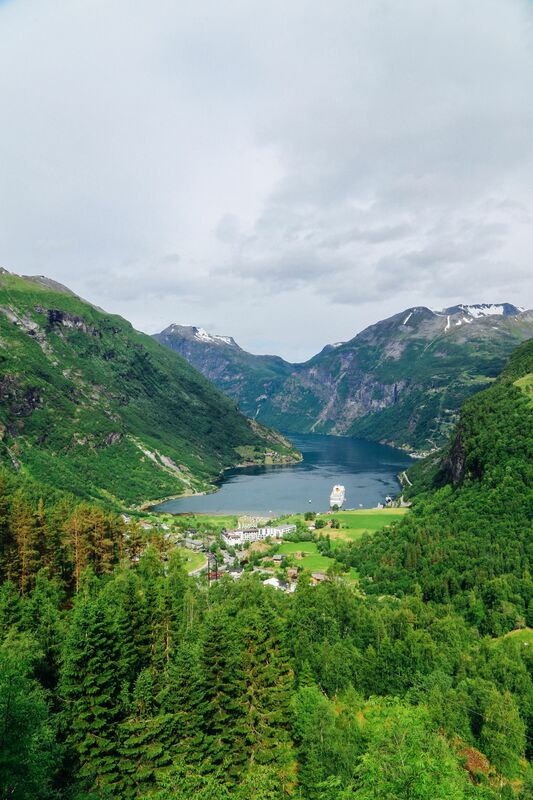 How To Inspire The Inner Explorer Within You!